It's amazing the problems drinking can get you into. One little swig from the wrong bottle and you go from being an ordinary Dutch sea-captain to an unhappy immortal, drifting around the world with your similarly immortal crew, suffering from peculiary whiffy side effects. Worst of all, Richard Wagner writes an opera about you. Feeling a little stressed a while ago so I ditched my To Be Read pile for the present and started wandering through some old, light favourites. Having finished all the M.Y.T.H. Inc. books on my shelf I stuck to that shelf and came across some books by Tom Holt I’ve not read. I find I’m not enjoying all of his books, something I’m quite surprised by. 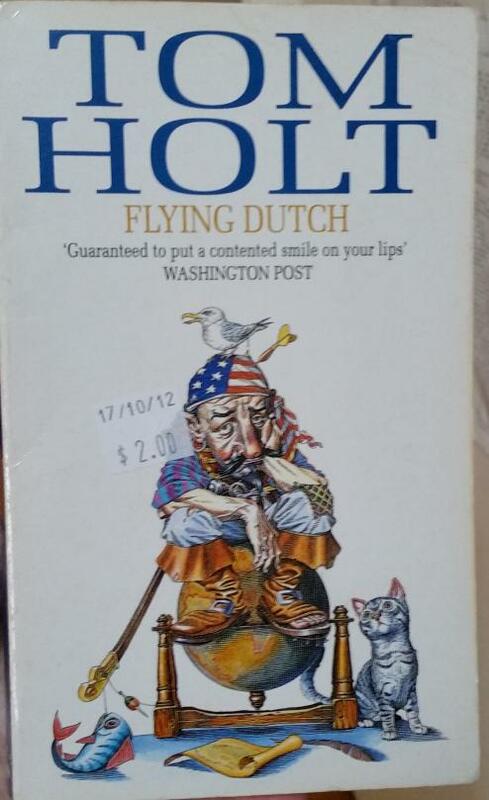 Flying Dutch is one I enjoyed but the book after it I gave up halfway through. I do enjoy books which are a little quirky and that describes Holt’s writing. It also describes Robert Asprin and Terry Pratchett. If you happen to know of any female authors who also write quirky I’d be very happy to add them to my reading list. But speaking of quirky. What Holt does in this book is look at the Flying Dutchman legend and give us a potential explanation for it. He brings a female accountant into the mix and the whole story is a little bizarre. I enjoyed having an accountant as the hero. Accountants aren’t generally heroic figures and this one doesn’t quite fit the bill, but she’s sick of being pushed around and decides she’s going to do something her boss might not agree with. One thing I found amusing was how Holt has imagined a four hundred year old man might evolve. Vandervecker, the Flying Dutchman, has evolved from someone who doesn’t think beyond the next cargo to someone who reads science articles and perform scientific experiments. Then you’ve got Montalban, the man who created the potion making himself and the crew of the boat immortal. He’s evolved to such an extent that he is credited with many things, including the creation of nuclear power. I thought this was a fun thing to do. I’m sure it would work for some people but others would probably continue to vegetate and do nothing more than they did before. I can’t produce an affiliate link for it, if you want to read this you’ll need to find a copy by yourself.